if you would like to save even more click here for more options. Save an additional $2 per disc! Join JEMClub now, and automatically receive all other new JEM releases at 10% off, plus free US shipping (International: $3). JEMClub members keep a credit card on file and automatically receive one discounted copy of every new release. See the JEMClub page for details. When you are done, close the JEMClub page to return to this page. Unfortunately, many of the precious recordings that make up JEM's priceless archive are degrading. We must rescue them before it is too late. Please watch this short video about our efforts and then become our partner by supporting JEM's underlying mission; to Preserve, Restore and provide Access to the recordings that make up this treasured archive. Because Access is one of the pillars of our mission, we've made the basic Living Torah membership more affordable but we are also turning to you for support. If you can afford to (and we must ask ourselves "can we afford not to?") please lend your financial support to the Archive project today. 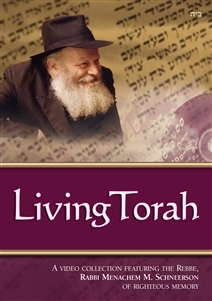 ** Your credit card will be charged aproximately every four weeks, before we ship out each new Living Torah DVD. We reserve the right to vary the payment amount at any time but will not do so without first providing you with at least 15 days notice via email. The authority to debit your account every 4 weeks remains valid until you notify us to cancel. Offer valid for Shluchim listed by Merkos L'Inyonei Chinuch.